I was lucky enough to receive an Advanced Reading Copy of Shannon Hale's newest book, a sequel to the Newbery Honor book "Princess Academy." At first, I feared a sequel would entail the same elements that those awful Disney film sequels do: a long-lost relative of the heroine who is either the new generation of hero or the new generation of villain, the unnecessary or unbelievable revenge of a previous villain, a sassy talking animal here to prove himself anew. Of course, Shannon Hale has better things in store: I was amazed by the brilliance of this novel and may even like it better than its predecessor. The novel chronicles the time leading up to Britta's wedding, at which the girls of Mt. Eskel will serve as ladies-in-waiting. Peder joins them, reuniting some of the most beloved characters from the first book (including Frid! I adore Frid!). Meanwhile, Miri becomes a student at the Queen's Castle, where she meets the fascinating and alluring Timon, who shares the same ideals she does about education, politics, and philosophy. What Miri soon learns is that unrest troubles Asland, creating whispers of a revolution. Will she get caught up by her new role as scholar, fighting for her political ideals at any cost--including the safety of Britta? Or will she be tethered to her prior loyalties to her friends from Mt. Eskel? Shannon Hale's new book is a gem, beautifully written, fast-paced, and incredibly intelligent. The political landscape of Asland and Danland harkens back to the turmoil-fraught times of the French Revolution, a clear inspiration for the novel. Hale's careful incorporation of Enlightenment philosophy (particularly that of John Locke) and her allusions to French historical figures (the executed Queen--Marie Antoinette, anyone?) make "Palace of Stone" an excellent companion novel to any middle school or high school history course. Her consistent return to one ethical dilemma marks Miri's progress throughout the novel, including the way she thinks about her place in the world, the value of her actions or inactions, and the far-reaching scope of her own abilities. (The question: in the event of a fire, which would you choose to save: a priceless painting or the life of a convicted murderer?) It is exciting to read a middle grade-YA novel in which these issues are examined so beautifully. Aside from these factors, which make my inner lit-geek weep with happiness, the novel contains many secrets to be unlocked (including one about an undiscovered power of the linder stone) and moments of sparkling humor and romance. Readers will be on the edge of their seats from the first couple of chapters through the satisfying resolution. Shannon Hale continues to illustrate how much potential her Miri--named after a flower that turns to face the sun--has for growth and adventure. How can I find words to describe my adoration for this book? It was completely perfect! I fell in love with Shannon Hale’s writing in a whole new way. In so many ways it was almost better than Princess Academy. It was wonderful getting a chance to check up on my old friends from Mount Eskel. 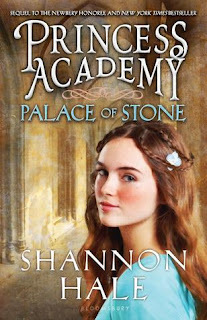 I didn’t think it to be possible for Shannon Hale to have improved upon Princess Academy, but I think guess anything is possible! She took off a year after Princess Academy left off, and this time sent the girls down from Mount Eskel, the see what life is like for the other Danlanders. The new setting was just as vibrant as Mount Eskel, but with a fresh new feeling about it. The reader was experiencing things for the first time along with Miri, and I loved that. Everything felt foreign, but quickly grew friendly and familiar. I think the reason this book was so amazing and powerful were the lessons it taught. Ethics and Revolution are the two big themes of this book, and they’re beautifully presented, without being overly political, and I thought they were handled masterfully. I personally consider this one a little bit more YA than MG because the characters are older and wiser, there are more complicated themes, and there’s a little bit of romance. That isn’t to say that it’s inappropriate at all, I just feel it would be more appreciated by an older reader. Violence: Moderate references, although not graphic: some intense action scenes and use of muskets/pistols in a revolutionary context. You can read Bookshop Talk's interview with the author, Shannon Hale, here! I'm excited about Princess Academy 2! Hey there! I’m a fellow blogger/writer looking to meet new people and discover great blogs, and I’ve just gladly added myself to your followers!! I would also love to have you check out a $50.00 Giftcard Giveaway I’m having right now!